This post is the second of a monthly series of very long blog posts on innovative college astronomy teaching. This post includes ideas about: need for a textbook; making useful PPT slides; finding the best images; using videos in class; and communicating with students via txt & email. You can find the first, introductory post here. We’ll start building your new toolkit with an efficient information delivery system. You know stuff—like astronomy—that students need to know. You also know important information like what’s the most effective pathway to learning the broad domain encapsulated by astronomy. You also know when exams occur, and how students’ grades are calculated. You might even know which day students’ will complete their course evaluation forms evaluating whether or not you helped them learn and followed an organized pathway to get them there. All of this information needs to get from you to your students at the right time, at the right pace, and in a comprehendible format. In this chapter, we’ll show you ways to accomplish this important task. The first-tier question a compassionate teacher who wants their students to love astronomy grapples with is precisely where do students get that information from? (If you don’t know why we are advocating a goal of students loving astronomy as a result of your course, then you skipped the first chapter and need to go back and read it first. Really.) This dilemma is often characterized as the astronomy teachers’ version of Shakespeare’s haunting question, 2B or Not 2B, to book or not too book? In other words, will you require that student buy a specific textbook? Books are Expensive Compared to tuition, fees, parking, and supplies, the price is negligible. Getting around these flaws takes some highly skilled tap dancing and we propose it just isn’t worth the Herculean efforts needed to successfully go textbook-free. You are exposing your course evaluation scores to some serious liabilities if you and your notes are the sole source of information and expertise in the class. Sure students CAN go look up stuff and get another perspective, but we propose that most don’t. In the case where there is no clear supporting textbook readings assigned to students, the end result is an implicit and sizeable pressure on students—probably completely unintended by the professor— to simply rote memorize nearly everything that their professors say (or type onto a PowerPoint slide). It is these “memorized transcripts” that end up being what students are able to answer on exams. At the same time, a hidden social contract in the introductory astronomy class causes professors themselves to feel a sizeable pressure to only ask questions about what they specifically talk about in class. For our money, this is a LOSE-LOSE bet. Taken together—and especially in light of the arguments forwarded in the previous post—it seems that the winning approach is to consider professor’s job to be about linking students’ thinking to the ideas of astronomy and giving students feedback about how well they are learning the concepts. This is in contrast to being the one individual responsible for delivering astronomy ideas in their entirety. As a brief aside, we know that some folks have tried using trade books, coffee table books or extensive fact-based web sites. Although these are attractive, particularly in how they are illustrated, they lack the tried-and-true pedagogical tools that many, many students, publishers, and authors have worked through and tried to perfect over the years: explicitly stated learning goals, headings to structure student thinking, end of chapter summaries with review questions, and, gasp, even bold-faced vocabulary words to help focus student attention. We’re not arguing that these things are perfect and are not often overused. However, what we would say is that these pedagogical clues are important enough to student readers that having them in a textbook is more important than the pretty pictures and pedagogy-free writing of coffee table books. Web-pages, no matter how attractive, usually suffer from this same disadvantage. Returning back to the dangers of going textbook-free, there is a real threat to equity here, but it isn’t that textbooks cost too much. The fact is that some students are preferentially disadvantaged more than other students when professors purposefully choose not to assign readings connected to their teaching from a textbook—those are the students who already struggle with learning from your lecture. Teaching using a textbook as a tool is pedagogical skill well worth learning. There is ample research out there suggesting consistent text readings are important resources for many students, including those students who are most in need of extra help. Many students cannot take notes and listen to lecture at the same time. Students with specific learning disabilities—reduced working memories, learning English as a second language, hampered with poorly developed spatial reasoning skills—struggle mightily to glean concepts and facts from lecture alone. Moreover, non-standardized narratives from the Internet often lack the critical learning cues and structured coherence usually found in among textbooks. Moreover, not having a textbook that is a core feature of your class unnecessarily makes life harder for our students who have A.D.D., reduced working memory. All of this points to a simple solution to the quandary of 2Buy or Not 2Buy. Students need to be assigned a consistent source of well-presented information. What about students that don’t read? We posit that the consistent problem that most professors’ face related to textbooks is nothing short of Operator Error. Some professors never ask students to be responsible for learning from their textbook. Some professors even stand at the front of the classroom and read out loud a textbook for students. Really. In either case, students have no reason to read the book. We’ll give you specific strategies down the road for how to leverage students’ outside of class reading and how to hold students accountable, but for now, let’s settle this question of 2Buy or Not 2Buy—you need to choose a textbook consistent with your teaching philosophy and make it a core feature of the organized learning pathway you design for your students. Notwithstanding unexpected technical difficulties, I can remember the only time I’ve seen an astronomer intentionally teach for an hour without support from a writing board or a projector, computer, overhead transparency, or slide carousel; if you haven’t guessed, it was Harvard’s astronomy historian, the legendary Professor Owen Gingerich. So, we are taking it as an initial boundary condition that you’ll be using visual support as a consistent strategy to get students information about your class. Just like we’re not advocating any specific textbook for you, we’re not advocating any particular commercial tool. However, so that we have a shorthand notation for the general concept of some projected visual, we’ll hereafter use the commonly recognized abbreviation for MS PowerPoint, PPT. We already know that you definitely don’t want use PPTs that have too many words, too small of figures, distracting transitions and animations, or insufficiently contrasting colors. You’ve endured too many of those yourself at professional science conferences. But, the question at hand really is what about your PPT will help improve your course evaluations? In other words, what will enhance students’ perception that you want to help students learn and that you follow an organized pathway? Fortunately, purposefully designed PPTs can dramatically help here. As a first step, we should review the basic rules of what does and does not help on a PPT. You might be thinking to yourself that you already know all of these things, but a quick tour through your building peaking in on other professors’ classes or wandering through scientific conference presentations should remind you that we can all forget the basics too often. Here is a place where a review of your materials from a confidential, critical friend can help. A critical friend is the one-person you can depend on who will take time to quietly let you know when you have spinach stuck in your teeth or that you embarrassingly mistyped something in that ranting Department-wide email-memo you are about to send. This person does not necessarily need to be at your institution, and perhaps it is better that they are not. But it needs to be someone you respect as an equal as well as a confidant. If you don’t have a critical friend, you need to start nurturing such a relationship so you have someone with which you can exchange your PPTs with to check for problems one of you might have missed. ¨ The problem with projecting complete sentences is that students have been long conditioned to write down everything on the PPT, no matter how much you beg them to do otherwise. This includes the capital letters starting the sentence, illustrative adjectives & adverbs, and punctuation at the end. We promise you that you do have the unexpectedly large amount of your limited each week available to allocate toward teaching your students how to effectively and efficiently take notes in addition to teaching astronomy. You could staunchly maintain that college students should already know how to take notes and it isn’t your responsibility to teach them how, but then you’ll likely demonstrate to your students that you aren’t actually interested in helping them learn. In other words, a wise professor wouldn’t unnecessarily provoke sleeping bear on this one, especially if the bear also completes end of course evaluations. The notion of avoiding complete sentences on your PPT is part of the broader teaching strategy not overwhelming students. You probably wouldn’t be surprised if we reminded you that learners cannot learn from a spouting fire hose of information drenching them with as many facts as possible. Although the PPT-experts say you should avoid unnecessary pictures, we would argue otherwise. PPTs that only contain bullet points are as monotonous as some of those memorable professors you had in graduate school. Pictures, even if gratuitous, serve to break up the boredom potential. Regardless, you should always talk about the images you project. Unlike you, novice astronomy students do not readily know what an image is or what is important about it. Students also won’t have any sense of scale, even if a tiny legend is embossed across the bottom. We’ll talk about where to find pictures for your PPT and how best to use them in a bit. However, we need to talk about organized systems to get information to your students using PPT a bit more. them early is that students can allocate their scarce class time attention to annotating the PPTs rather than furiously taking complete notes of their own. There are obvious advantages to this, not the least of which is ensuring you actually have your notes done more than 60-seconds before class starts. This also means that students who miss class or didn’t successfully copy down all of the PPT’s information have a back-up information system. A contrasting perspective is that students won’t be motivated to come to class if the PPTs are available elsewhere. We have to agree with the students on this one; if the only reason students have to come to class is to get information to memorize from the PPT, why go to class at all? The remaining chapters in the book are written specifically to counteract this notion: Your class time should be so well organized and carefully designed to be so incredibly valuable that your students wouldn’t imagine missing it in their wildest dreams. If that’s not motivation enough to keep reading this book, we don’t know what would be! If you do decide to distribute the PPT to students, we recommend that you strategically remove key information that students need to fill in. Many professors find providing what we affectionately call Naked-PPT to be highly effective. More formally known in the formal science teaching literature as “guided notes”, these are PPT with key information removed and replaced with a blank line for students to complete themselves. The underlying thinking here, confirmed by systematic education research, is that the process of students’ actively dressing the Naked-PPT during class will keep students more attentive. Moreover, changing your PPT into Naked-PPT is takes just a few seconds. First, complete and save your PPT presentation that you’ll be presenting in class. Second, save your final presentation a second time with a new name, adding –Naked.ppt to the end of the name. In this Naked-PPT version remove one or two vital pieces of information from some of the slides. As a word of _______ here, don’t go overboard and remove too much information. You only need to add a few blank lines here and there to make strategy this work like a charm. Removing too much information will make students perceive you are trying to trick them into coming to _______ by withholding information they need to succeed, which they will resent and report when they fill out your end-of-class _______ forms. Finally, distribute this Naked-PPT version to your students instead of the version you present during class. It works with images too! The process of creating fill-in-the-box images is surprisingly easy. All we have done to create the example shown is insert rectangle shapes over some of the targeted words and filled them with white. Another strategy engaging teachers use is to slowly increase the amount of information on their PPT. Like the potentially provocative label Naked-PPT, in the old days professors would call this strategy by an equally lewd name, the ‘stripping transparency.’ The strategy then was to cover most of your projected information with an opaque piece of paper, and slowly reveal information as it was needed by the students. The thinking in those days past, which is still applicable today, was that students would hurriedly write down everything on the screen before listening to anything the professor had to say and, in the process, miss the first half of the professor’s lecture. This is because most students can not listen and write at the same time, so the tactic was to limit what students had available to copy at any one time. Today, the strategy is to use the Animate function in most PPT computer programs to slowly dispense information. Adopting some version of this yourself is probably a wise choice for your presentations. Not only does this work well for bullet lists, but it also works well when teaching with images, which we will describe in the next section. No matter how you use PPT, most professors find creating PPT to be an enormously time consuming task that effectively crowds out the more important aspects of teaching students to love astronomy. This is especially true if you are a perfectionist. The truth is that students don’t notice or appreciate whether or not your slides are perfect. We recommend that you adopt the perspective that 80% good is good enough. This isn’t so you have extra time to get to the golf course; instead, we want you to use all your available teaching-innovation energy to implement the interactive teaching strategies in the remaining pages of this book. You might be surprised to learn that nearly complete PPT sets already exist for your class. Most book publishers have already paid someone to work really hard creating PPT sets for each chapter (they’ve also created test-item libraries, among other valuable resources). Typically, these PPTs already use images from your selected book and have the most important vocabulary included. If this isn’t enough, there are also PPT repositories online for all topics that are uncovered by Internet searches. Moreover, you can even use PPT sets designed from other books. If you don’t know where to find these, call your book’s publisher and marketing representative who will enthusiastically share the many resources they’ve created. By all measures, none of these PPTs you’ll find are close to perfect, nor are these tightly aligned to the specific teaching you want to do. These are, however, sufficiently good starting places to adapt to your own teaching, especially if you adopt“80% good is good enough so there is ample time to improve other parts of class” thinking. Let’s pause for a moment and be glad you don’t teach accounting or finance classes. Those are fine disciplines, we’re sure. However, they don’t have nearly the array of inspiring images available for teaching that we have in astronomy. Some people might get chills looking a supply & demand graphs, but we most definitely do not. Instead, images and videos help illustrate to students that astronomy is first and foremost an observational science. Better still, astronomy is… beautiful! Let’s start with the question of where to find pictures, images, illustrations, animations, and movies before we discuss how to use them most effectively. The problem here is not that there are insufficient visual resources available for teaching. On the contrary, there are far too many available and the vast array can be as overwhelming for students as it is for us! The question is not what, but which? As a seemingly unrelated story, consider people trying desperately to follow a successful diet in order to lose weight. Weight loss is straightforward in theory: Weight loss occurs when more calories are burned in the course of a day than consumed. As told to us again and again by our elders, the difference between theory and practice is that in theory, there is no difference. What doesn’t work when is simply to try to power through life knowing you should eat carrots instead of burritos for lunch. What the nutrition researchers tell us is that a dieter’s most successful strategy in this case is to eliminate options. In other words, the most successful dieters pick five healthy meals they like to eat and eat only those meals, no options. If you go off the path and try something new, that’s the first step to falling off your diet. This doesn’t sound appealing, and it’s not, but it works. Let’s apply this same notion to finding pictures and videos to help your students lea rn astronomy. 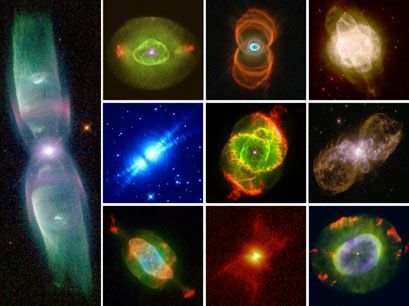 Just like there are at least 36 different hammers in the tool section of your local hardware store, there are at least 36 different places to find that perfect image of a planetary nebula for your PPT. One of us has spent hours and hours and hours looking for just the single, perfect image to illustrate a concept to students. Hours and hours for a single ideal image. Really. We beg you; do not fall into the timeless black hole of endlessly searching for the perfect image. Instead, adopt the dieter’s approach and painfully limit the number of places you’ll look for an image to five online repositories. You can choose to look at more places, but at your own peril. Yes, Wikipedia has great images. Yes, Google Images has wonderful pictures. Yes, the European Southern Observatory has well-classified photographs. Yes, you’re right, that place does too. Astronomical Society of the Pacific and Foothill College’s resource-guru Andrew Fraknoi keeps an active list of nearly a hundred such repositories. As we said earlier, there is no shortage of places to find stunning astronomy to share with students. Remember, your task is to not be paralyzed by the overwhelming opportunities. Anytime you go to an image repository, look for links to “Top 10” or “Heritage Collection” or “Greatest Hits” or “Anniversary Images” to find that sites most popular images. Be aware that some images are copyrighted, and only some exist in the public domain, but most are available for “fair use” for limited educational purposes. Your first-tier approach to avoiding legal violations is to always note on your PPT the precise web address where the image came from so that your presentations model how to students can avoid plagiarism. Now let’s turn our attention to how to use images most effectively for teaching. As a first step, you will be rewarded handsomely if you nurture within yourself a habit of always talking about each projected image three times. Before you balk at this, take a moment and imagine an expert weather newscast for a city you probably don’t live in. The best journalists are trained to say, “Let’s take a look at the weather out in the Rockies. The chilly, north winds are picking up the southeastern corner of Wyoming. The city of Laramie is expecting another two feet of snow.” Notice how they’ve oriented the audience three distinct times, each one with more specificity than the last: (i) Rocky Mountain region, (ii) state of Wyoming, and (iii) Laramie. Because it takes an un-oriented viewer a few seconds to digest an unfamiliar image, the strategy of “say it three ways” when talking about an image slowly gives the audience time to catch up with you. Now, imagine how you might talk about the image of a comet nucleus three times. Perhaps you could say, “Here we have a city-sized comet. The 6-mile wide comet is mostly made of ice which begins to melt when it is close to the Sun. You can’t see this view from Earth because the comet is so tiny; this close up picture was taken by a spacecraft visiting the comet.” Notice these three sentences aren’t three separate things you want students to memorize. Rather, these are three things that give students things to notice while their brains are trying to figure out what the picture is. In addition to habitually orienting your listeners to the image by dragging your feet about getting to the good stuff, expert presenters also explicitly point out what viewers should notice. Whereas inexperienced presenters use a laser pointer and rapidly circle things on the screen like they are using a burning Fourth of July sparkler to write their name in the air, the best presenters do something much better. A picture really is worth a thousand words, and students can be quickly overwhelmed by the information contained within a single picture. One strategy is to insert an oval shape over an image to direct students’ attention to what’s most important. Even better, many PPT-style programs will allow you to draw on an image while you talk about it. Television sports commentators do something similar when drawing on an image to highlight player positions or holes in the defense when explaining a particular aspect of a game. 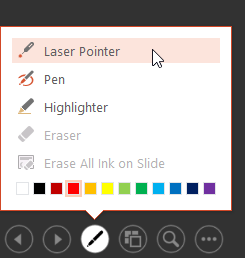 The most common way is to draw on your PPT is to call up a drawing tool by doing the equivalent of a right-click on your PPT when in play/presentation mode and select pointer. If students have a copy of your PPT, they can also draw on their copies, further engaging them actively in your presentation. Drawing on your PPT further slows down your presentation, giving students a much needed chance to catch up with you and better follow along with your presentation. But, if you really want to engage your students, giving them boring figure caption style descriptions is not the way to go. Instead, we recommend that you pose questions about the pictures you are showing. Posing questions requires students to engage in the picture and make inferences, whereas clearly stating facts requires nothing on the part of students other than to write it down. This picture shows more than 10,000 galaxies in a tiny region of space Do astronomers compete against one another for highly limited telescope time? Water observed on Mars How could a Faster-Better- Cheaper Mars Phoenix Lander is created from spare parts and finds water beneath rockets? Pluto is now classified as a dwarf planet Pluto is still there; but, why can’t smart humans agree on its category? TMT is being built in Hawai’i Where should the next great new telescope be built? Our thinking here could naturally be misinterpreted as suggesting that facts are unimportant or that students don’t really care about hearing cool facts. In stark contrast, we are convinced that students really do want to hear about what’s it called, how big is it, how far away, and how did it get that way? What we are advocating here is that although precisely articulated and cleverly articulated facts are definitely cool, they are insufficient on their own to deeply engage the audience in a memorable experience. Given that memories are the residue of thinking, it behooves the compassionate professor to be sure that the students has the opportunity to ponder questions, make inferences, and be positioned to welcome the facts and figures available to them when they’re primed and ready. You’re probably already thinking that high-quality videos exist to do precisely what we’re talking about—present high quality images and use additional graphics to support the presentation. This might tempt you to replace large portions of your class time with high-production videos. These videos can play an important role in the organized teaching plan you have created for your students, but only to a point. There is definitely a right-way and a wrong-way to use videos as part of your class. It’s not that there aren’t great video resources out there. On the contrary, there are amazing video resources available for teaching astronomy, perhaps more than any other field (except perhaps oceanography). The number of high production astronomy videos made in the last decade is nothing short of astronomical. Satellite television providers such as the Discovery Channel, History Channel, NASA TV and Science TV have joined the longstanding and highly respected video production efforts of IMAX, PBS, and the National Geographic Society NatGEO—just to name a few of the many talented production efforts out there—to super high-production quality videos and video series. For one, the most highly rated of these videos show the best “talking head” profiles of some of the most influential and photogenic astronomers around. Neil deGrasse Tyson has thousands of social media followers and has even appeared repeatedly on wildly popular television talk shows like Comedy Channel’s Daily Show and the Steven Cobert’s shows among others. High-production quality videos go a long way to helping students see that astronomy is a human enterprise. Moreover, many of these videos do a reasonably good job of showing today’s astronomers as being highly diverse in racial demographic and quite a few women. The good news here is that television can play a role in helping expand and enhance the stereotypical image of an astronomer from being only a white-haired (or non-haired) white male smoking a pipe in a cold, mountain-top observatory to a more contemporary view of astronomers as being equally likely to being a partying group young males and females from across the racial spectrum. As evidence, we remind you of the various NASA mission video clips showing young astronomers dancing, yelling, and celebrating during successful Mars landings. These videos are enormously popular on video websites like YouTube. Some of these individuals even acquire a tremendous social media following that greatly extends their previously allotted 15 minutes of fame. In other words, these videos can serve to enhance the image of astronomers as people, and perhaps even improve the nation’s evaporating science, technology, engineering and mathematics (STEM) career pipeline. Perhaps more important than showing our tribe of astronomers as being a diverse group of people, these videos include the latest and greatest graphics-intensive animations and computer simulations. There are only three words to describe these animations—and all three of them are “WOW.” Many of these animations have a wow-factor that make even the most curmudgeonly critical astronomers look up from their computers and pause to watch. Over the last decade, the entire career field of scientific visualization has stood up to take advantage of and match new computer graphics capabilities with the high-computing power that was once restricted to supercomputers and is now found waiting inside desktop machines. NASA Goddard Space Flight Center’s Scientific Visualization Studio, as but one example, has hundreds of videos ready for Internet download that can be used equally well in television documentaries as well as in astronomy classrooms. There are downsides here. As it seems with every “force” in the universe, there are unfortunate dark shadows of using even the highest quality and most scientifically accurate videos in your astronomy class. One has to do with the innate—and perhaps immutable—nature of students. Will students pay attention to a video better than a live lecture? At the same time, your colleagues probably wonder, even if only as a mere idle curiosity, how many students are really paying attention to a lecture as an hour wears on. We often hear colleagues say, “ah, today’s students just can’t seem to pay attention like they used to.” Probably not surprising, the answer from decades old research is not many: This research was done back in the days when our colleagues were young so they are really talking about themselves! Despite some nostalgic thoughts otherwise, it’s no different today. In the end, students are not likely to naturally watch a video with any more interest than they are to passively watch your lecture. Research backs too backs up this supposition. Alison Gopnik, author of the famed book Scientist in the Crib, reports in her more recent research that infants do not pay attention to a Skype video call from their mother with nearly the same attention that they will when mom is physically present. The more argumentative reader might pose that students are able to watch Hollywood movies for hours on end with rapt attention, remembering some of the most obscure details. Again, research helps us understand what is going on. Daniel Willingham proposes in his book, Why Don’t Students Like School, that video material being presented needs to at least have the potential to make an emotional connection with the listener in order to be deeply remembered. Hollywood movies and adventure television shows do this in spades: the damsel in distress ready to be rescued, the seemingly impossible to solve mystery, the hero’s journey from adversity to triumph. Given the above, one should be greatly surprised if even the most accurate of black hole animations stands well-poised to make an emotional connection for many students. Another component of a darkly shaded side of using videos has to do with the innate nature of professors. By and large, professors seem to be insanely busy people—if you aren’t sure this is true, all you need to do is ask a few and they will be happy to tell you how busy they are. Many professors travel frequently and need to miss class. Because professors are people, when a professor has to miss a class or don’t have time to prepare for class, one seemingly easily implementable solution is to show their class a video. As a substitute for a well-planned lecture, rather than no lecture at all, a video might initially seem like a reasonable option. As pointed out earlier, modern videos have fantastic animations, good looking and well-spoken experts, and sometimes engaging story lines. But the reason we have professors who are experts in the field teach classes is not that they are great speakers—if we only needed great speakers we’d hire actors to teach our classes—rather, we hire experts because they should be able to coach students along the pathway of learning astronomy. When a professor understands the material, they are able to probe students understanding by posing examples and counter examples of different concepts to help students extend their understanding. Moreover, they are able to provide rapid feedback to students who are struggling to learn astronomy in ways that performing actors just can’t do. In other words, it’s the two-way human interaction that is needed, not the attractive downloading of information, which constitutes effective astronomy teaching. Fortunately, there are some effective strategies you can use right away to take full advantage of high-quality video resources. The most basic rule is to use only short video clips of about 3 minutes (5 minutes as an absolute maximum). The underlying secret to success is to have a very specific reason for using the video clip and to fully inform students what they are about to see, why you are showing it to them, and what they are supposed to take away. This is precisely the same tried-and-true presentation skills from physics education research about how to do effective classroom demonstrations: What a professor does BEFORE showing demonstration is much more influential than anything that a professor does after the demonstration. This is going to be true with using videos too. In fact, one sure-fire strategy is to pause a video (or demonstration) in the middle and ask students to justify predictions about what they think might be going to see next. Really! If you are committed to having students watch a really great, but hour-long video presentation—like COSMOS—then the cardinal rule is that instructors need a scheme to help students intellectually participate in and interact with the ideas in the video. 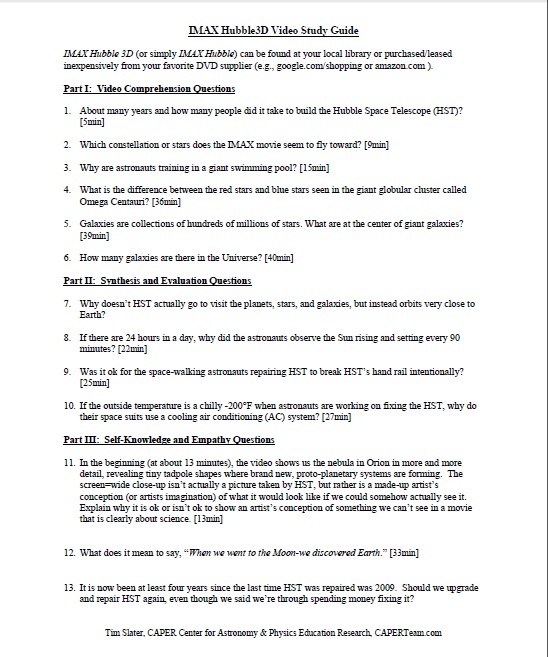 Motivated because we are trying to improve the different Internet-based, asynchronous distance learning astronomy courses we teach, we have been experimenting with Student Video Guide worksheets. The general idea underlying the Student Video Guide is to keep the student intellectually engaged with the video while it is playing. To be clear about how we use these, we give the students the questions on the Student Video Guide before the video starts and encourage them to look over the questions before the video starts so that they know precisely what that are looking for while watching the video. We quickly grade them for only three completeness: 2pts-mostly completed thoughtfully, 0pts-not very thoughtfully completed, and 1pt-somewhere in between. The truth is that there are amazing video resources available for teaching astronomy. However, education research clearly shows that it is irresponsible just to turn on the video as a classroom babysitter in your absence and blindly hope that students might benefit. Videos need to have a specific purpose for their inclusion and their rationale explained to students to generate their buy in. In other words, for videos to be an effective way to get information to students, you need to successfully convince students that the videos used will specifically help them get a better grade in your course and, most importantly, will help students love astronomy. To remind you where we are, students give the best evaluations to those professors who students perceive will help them learn and follow an organized learning plan to help students get there. In the domain of getting information to your students in an organized way, let’s talk about communication systems. As a caveat, we’ll say at the outset that how to best communicate with students changes quickly. Before the ink is even dry on this printing, specific email or cell phone systems might have become extinct as technological dinosaurs. So, we beg for your forgiveness in our seeming to be luddites and beseech thyself to read between the lines for the overarching ideas that you can apply right away. Probably the single thing that has changed the most since we started teaching is that students and professors rapidly—and too often thoughtlessly—pose questions and provide information by Email. In the old days, students usually had to wait until after class or attend a professor’s office hours to ask questions and professors had to wait until the Department photocopier was available to distribute information. This means that business-as-usual isn’t the same as it used to be. A professor who wants to get a high evaluation score on “The professor was available” needs a winning strategy. For the moment, let’s take a short aside and talk about strategic Email management. Because nearly all of us will strongly agree with the statement, “I get too much Email.” a professor who loses student information or doesn’t respond to students in a respectful or timely fashion will get lower evaluation scores than they would like. Please don’t contact me at my university.edu Email address because so much spam and junk mails comes through there that I will likely miss your Email, which I really don’t want to do. When you Email me at this special address I’ve set up for this class, I will be sure to get it and you’ll get a response by the end of the day on Tuesday or Friday when I respond to my Email. If there is an emergency and it can’t wait, don’t use Email to contact me, call my office phone number and leave a message so I can get right back to you. Be sure to set up a polite and respectful auto-responding vacation message that repeats basically the same thing. I received your email. Thanks for taking the time to send it. However, I usually can only check and respond to emails on Tuesday and Friday afternoons. If you haven’t heard from me by then, please contact me again. If this is an emergency and can’t wait until then, please call my office at 808-123-4567 and leave a detailed message. See you in class! That’s it. Really. This is all it takes for students to feel like you care about being sure you get their Email message and that you care about their learning. But this is only half the battle. You also have to respond when you say you are going to. However, when you’ve set up a special Email account just for class issues and set up a time when you are going to respond, this becomes very easy if you follow three simple rules. Rule #1: You will NOT forward this Email account to your most frequently used Email account. This helps you stay focused on other academic pursuits without distraction. Rule #2: You will ONLY read and respond to your teaching Email account on specified days and times. This allows you to have all of your class information at the ready and not be distracted by other academic pursuits. Rule #3: You will PREWRITE most of your answers and copy -> paste your responses then make small edits. This allows you to provide seemingly thoughtful and un-rushed responses helping students know you care about their learning and follow an organized pathway to help them learn. We keep a folder of responses-to-students.txt files that we can readily copy -> paste into Emails to students. They all start with a real salutation (Dear ______) and a polite introduction saying their Email was appreciated (Thanks for taking time to send your question by Email), and then most often restating some information that was contained in the syllabus (If you can’t access your online homework, you’ll need to contact Tech Support at 800-123-4567 right away. Don’t worry, we’ll drop your lowest homework score from your final grade calculation so that a technical hiccup won’t negatively impact your grade). We then add an ending sentence about something from the class or in this week’s sky so that they can see the Email response is current (Don’t forget to look for Mars in the western sky this week at sunset). The multi-fold goals here are to: (i) provide thoughtful and timely responses to students, (ii) save you time, and (iii) keep teaching-issues separate from other academic pursuits and responsibilities. You’ve probably noticed that students often communicate using the mobile phones in ways besides using Email. The really frustrating part for professors is that the most popular communication system seems to change every semester, so it is hard to adopt one. However, if your goal is to be sure that students can get timely information delivered to them—and it is—you need some system to quickly get information in front of them so that they know you follow an organized system to help them learn. We happen to like a system called Remind.com—which we hope isn’t too out dated by the time you read this. We’re not advocating this one specifically, it’s one of a million that are out there. What we like about Remind.com is that you get a separate code for each class you teach and give to students who sign up to receive your text messages. It’s totally private and no one can see anyone else’s cell phone number. You can also pre-schedule your outgoing text message reminders. The importance of this system is that you can send reminders about assignments being due the day before, or announce impromptu study sessions, or tell students about interesting sky phenomena they could observe (like a ISS flyover), or let students know that you’ll be a few minutes late to class because you couldn’t find parking and to please wait for you. Having a system to provide information and gentle reminders to students is an important part of designing and following an organized learning pathway for them. In other words, it helps broaden your communication pathway. If you want to supercharge students’ views of your commitment to teaching them to love astronomy, we recommend you consider holding some virtual office hours online. In days not so long ago, professors who held office hours in dormitory cafeterias or nearby coffee shops were often rewarded and awarded for their efforts. If you’re not in a place where this makes sense, then Internet-based virtual office hours can be an attractive option. There are countless ways one could do this by doing a little Internet searching. These might be Google Video Hangouts, Twitter-Chats, Skype desktop video conferencing calls and the like. You could encourage students to just drop by and chat or you could provide structured exam review sessions. The main thing here is to make yourself easily available at specific times, rather than opening yourself up to constant but fragmented access. This is important even if no student ever actually shows up because it provides yet another opportunity to demonstrate how much you care about your students learning to love astronomy. And who knows, maybe you’ll end up getting to talk even more about current affairs in astronomy than class time normally allows. Is the best astronomy education research ‘grey’? Does JAESE Count for Tenure & Promotion if it is an Open-Access Journal? Should I Teach ASTRO101 With Metric Units or US-Standard Imperial Units? 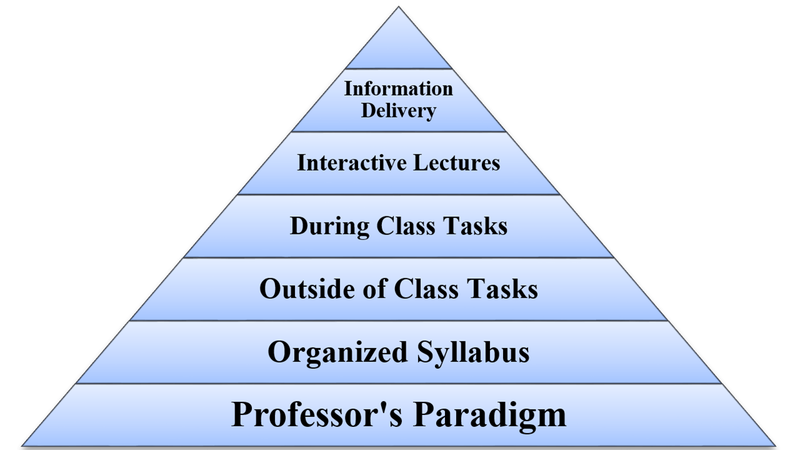 Can Your Syllabus Improve Student Motivation? To Textbook or Not To Textbook? That is the question. Should Your Astronomy Students Do Telescope Observing Online?